Home » general » WikiQuote screensaver for quote lovers that enables to view thousands of quotes. 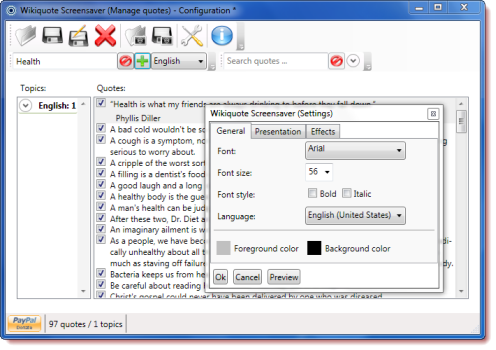 WikiQuote screensaver for quote lovers that enables to view thousands of quotes. if you likes quotes,there is a new screensaver for your window ‘WikiQuote screensaver’. It enables us to view thousands of quotes available at wikiquote.org.Wikiquote.org is an online encyclopedia of interesting quotes and proverbs on various subjects. It contains quotations from notable people and creative works in every language. There is also facility of translation of non english quotes. One Response to WikiQuote screensaver for quote lovers that enables to view thousands of quotes.